The maxillofacial region can be affected by a number of subcutaneous pathologic conditions that include developmental, inflammatory, infective and neoplastic entities. Many of these lesions present as a soft to firm painless swelling. 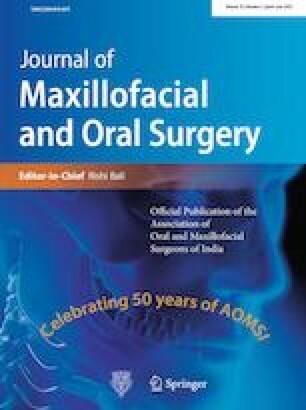 Differential diagnosis of such lesions requires thorough knowledge of maxillofacial pathology as well as anatomy to come to a correct diagnosis and provide effective treatment. Misdiagnosis and improper treatment can lead to other complications and morbidity. The commonly encountered lesions include dermoid cysts, branchial cysts, lipoma and thyroglossal cyst. Dermoid cysts are dysontogenetic cysts rarely involving the maxillofacial region (1.6–7% of all dermoid cysts of the body). The most common site of involvement in the maxillofacial region is near the frontozygomatic suture followed by cervical region. Some lesions have a deep component which may involve the cranial or orbital cavities. This is a retrospective study of the cases managed at our center from 2001 to 2017. Of the 12 cases in our study, all but one was involving the floor of the mouth. There were 11 males and 1 female. Swelling was the only symptom. The patients age ranged from 16 to 34 years (Table 2). The cysts were present for a period ranging from 6 months to 5 years at the time of reporting. All cases were managed with enucleation. The patients are on follow-up with no report of recurrence. The period of follow-up was 1 to 16 years. There were no complications postoperatively. The work has been approved by the ethical committee of the institution, and informed written consent of all the patients was taken for the study as well as publishing of the photographs. All authors have viewed and agreed to the submission.